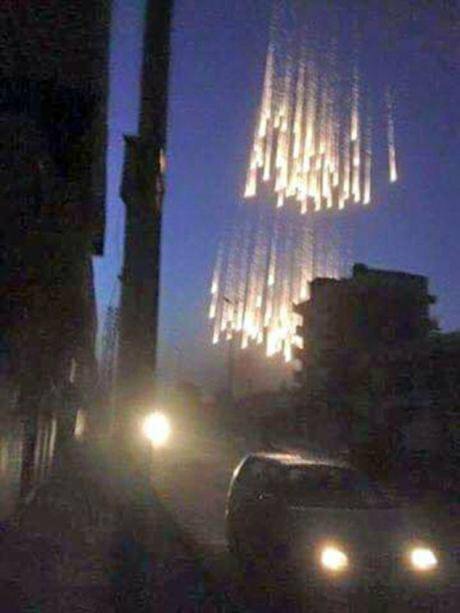 Picture: Twitter/Moonnor27In the beginning of June 2017, the international coalition supposedly fighting ISIS, dropped illegal white phosphorus bombs on the civilian areas of Raqqa in Syria. The operation "Operation Euphrates Wrath" spearheaded by US-backed Kurdish Syrian Democratic Forces (SDF) and their military wing the YPG, has begun to remove ISIS, or Da’esh, from Raqqa. But this onslaught does not come without major repercussions for the local population. These Syrian people have been suffering under the brutal repression of Da’esh as well as the continuous aerial bombardment over the past three years, either by the international coalition, the Russians, or the Assad regime. Either way, the local population in Raqqa, is paying a very heavy price for the massive aerial attacks on the town to safeguard the “freedom and security of the west”, a popular narrative used to justify bombing civilian areas controlled by Da’esh. However, as I write this, I have yet to see any western "ISIS specialist" journalist express any form of solidarity with the Syrian civilians of Raqqa, who are being held hostage by Da'esh and killed by phosphorus incendiary bombardment dropped by the international coalition. This is both interesting and deeply depressing. When I say “ISIS specialists” I don't mean academics but journalists who come and talk in western media talkshows: here is a list of journalists and some of their books. It is of course wonderful that they write books and news articles about ISIS. We have learned a lot about this illusive terrorist organization. These books are interesting reads to say the least, but they do not tell the reader anything about the Syrian people from Raqqa, their aspirations, their collective action, daily lives and history, or their resistance against oppression. It is as if these Syrians do not exist and do not resist Da’esh. They are merely the “nameless refugees” without agency. But these are real people, they are my personal friends, who still live in the areas under the control of Da’esh. Their relatives, close friends, loved ones, parents, children, uncles, aunts and neighbours, are now under daily threat of death from Da'esh and the massive aerial bombardments, including the illegal phosphorus. Some of them, I know for twenty years. I know their children, since they were two years old. Today, many are refugees in Europe. I spent many hours and days of my life in Raqqa. I attended weddings, danced dabke, smoked argileh next to the shores of the Euphrates, and had wonderful food. It is the place where 20 years ago, my car covered with flowers drove in to pick up the bride for a traditional Syrian rural wedding. I cannot keep my eyes dry whenever I watch that old footage I filmed back then. In Raqqa I have friends who are not on Facebook but with whom I have sporadic contact through Whatsapp. A place where I know people whom I have not heard from since a long time, and I eagerly wait to hear news to know whether they are still alive. In Raqqa, I have friends who were exiled by the regime and then jailed by Da'esh. Like the Italian priest Father Paolo who was imprisoned by Da’esh on 29 July 2013. Raqqa civilians are occasionally mentioned in the news about Da’esh as dead bodies, regarded by the Americans as an "inevitable fact of life" during the coalition's annihilation tactics done within the context of the "Operation Euphrates Wrath". But forgetting to mention that long before this massive international coalition bombing campaign started in September 2014, Syrian Kurdish and Arab ground forces had joined in the operation Euphrates Volcano/Burkān al-Furāt‎ that eradicated and removed Da’esh troops fully from Afrin and Aleppo province and was advancing beyond Al Bab. They did this on their own. With assistance from the Syrian civilians. Without international coalition bombardments. Without massive civilian casualties. Without these so-called "facts of life". But aerial bombardments seem to be the trend in Syria and indeed there are no red lines. I am not very fond of aerial bombardments. I have yet to encounter someone who can convince me that aerial bombardments in civilian areas are somehow useful. They are absolutely counterproductive to bring any form of peace, they create massive movements of people, chaos and resentment on the ground and if done with incendiary bombs like in Raqqa, they are simply war crimes perpetrated by the International Coalition. It hurts to see that the only thing that most journalists on western media news channels can talk about is Da’esh. Most of them only became interested in Syria, because of the entry and extreme violence of Da'esh, that started in 2013. Raqqa did not exist for these journalists, they probably never even heard of the city before that and had to look it up on Google. But there was a Raqqa before the arrival of Da'esh, a Raqqa that was free from regime control in the first part of 2013, where people went to the streets to clean up together. It was the first major Syrian city to be fully liberated by the Free Syrian Army (FSA). In 2012, before the release of jihadis from Saydnaya prison, much of these areas of Syria were being liberated by FSA. "We smelled five months of freedom" as my friends tell me of the period of freedom between the removal of the regime and the arrival of the first Da'eshis in 2013. Now some of these friends, who were left behind, smell death and the world does not care one iota. There is no condemnation of the use of phosphorus from any world leader yet. There are no red lines if it comes to the local people of Raqqa. Yes, it is deeply depressing. Some people find it difficult to “decide” whether to be in solidarity with the people from Raqqa, because the whole situation is “still very complicated to them”. I tried to summarise it as much as I can. Forty years of brutal dictatorship by the Assad family. Syrian people rose up. The Assad regime reacted with killing and torturing their kids and ordering its soldiers to kill protesters. Some soldiers defected. They formed the Free Syrian Army (FSA). The regime army reacted with aerial bombardments. Bombing funerals and demonstrations. The world didn't care. The regime used chemicals. The world didn't care. Iran and Russia pumped money and people in the regime army. The regime released jihadis from its jails. The country became a destination for foreign jihadis. The world didn't care. The world calls Syria a civil war. ISIS enters Syria from Iraq. The world didn't care. ISIS kills western journalists in Syria. Twelve foreign countries started bombing Syria. The world didn't care. Massive movement of people, scores of kids killed. The world didn't care. Russia started a bombing campaign. The world didn’t care. The only thing the first Syrian protesters wanted was freedom from oppression, social justice, dignity and democracy. The world still doesn't care. Now these Syrians are outside of Syria. Knocking on the doors of Europe. We should listen to them. Their families, their relatives, their loved ones are now still dying in Syria. The world should care.